They said it couldn’t be done. Three races into the inaugural TUDOR United SportsCar Championship season, and no LMP2 prototype had seen the top step of the podium. Leave it to politics, some said: IMSA’s balance of performance was hopelessly weighted in favor of the heavier – but more powerful – Daytona Prototypes. 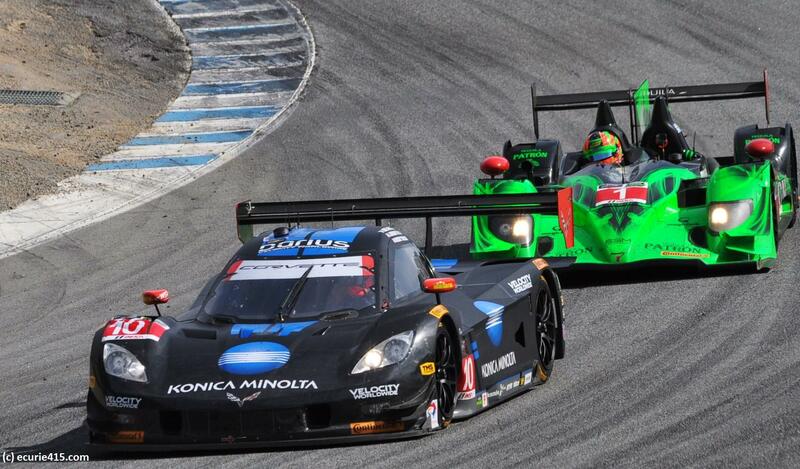 This was the natural outcome of the Grand-Am Series’ acquisition of the ALMS in 2012, said the critics. 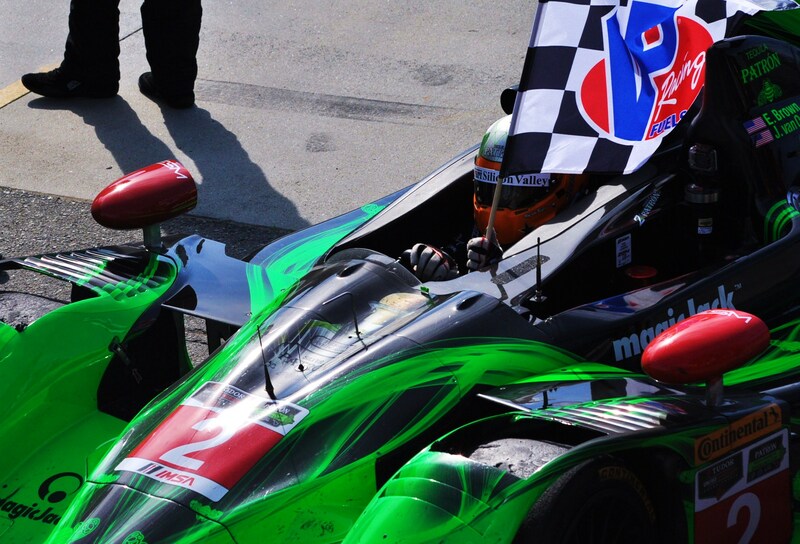 On social media, many thought the ultimate goal was to eliminate LMP2’s from the series. Johannes van Overbeek and ESM Patron Racing had other ideas. Taking advantage of Mazda Raceway’s slow corners, and benefitting from a rare mistake by rival Jordan Taylor, van Overbeek brought his Honda ARX-03b home in first, ahead of Taylor and veteran Scott Pruett, racing a Riley DP with Ford Ecoboost power for Chip Ganassi Racing. 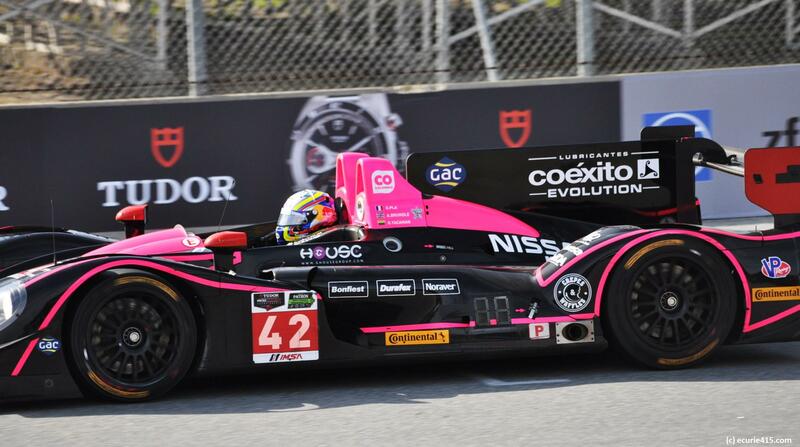 The race began with a scintillating dice between Jordan Taylor, driving a Corvette DP for Wayne Taylor Racing, and Gustavo Yacaman in an Oak Racing Nissan-Morgan LMP2. The close racing tended to answer critics who had questioned whether the two divergent prototpes could race competitively. After Monterey, the answer was an emphatic “yes”. Yacaman’s efforts were blighted by an incident between his teammate, Alex Brundle, and an Action Express DP driven by Christian Fittipaldi. But by that point, van Overbeek was ready to start reeling in Taylor. An uncharacteristic bobble by Taylor coming out of Turn 3 was all the room that van Overbeek needed to take the lead, setting up a win that no one expected, and a victory that settled some old scores. Spirit of Daytona took an early lead from polesitter ESM, resulting in a great battle between Michael Valiante and OAK Racing’s Gustavo Yacaman. Yacaman stayed hard on Valiante’s bumper for his stint, but Alex Brundle tangled with the Action Express prototype of Christian Fittipaldi at the Corkscrew, leaving the Nissan-Morgan behind (and penalized). 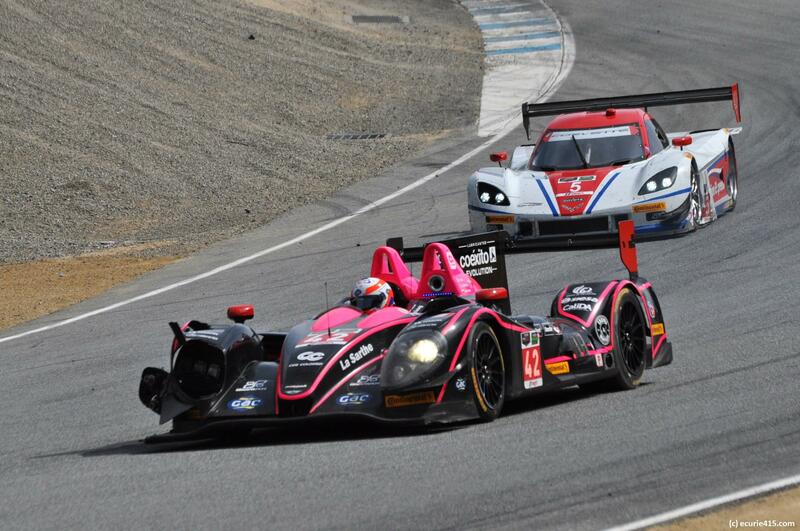 At least its performance reassured those who questioned the future of the LMP2 category. Brundle damages his own car and, ultimately, the 07 Mazda, which retired. This is not the correct way to exit the Corkscrew. 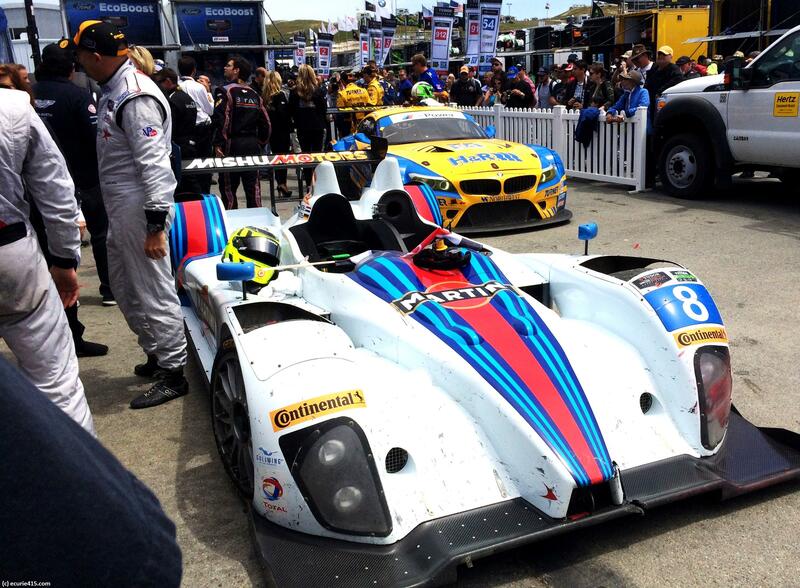 Starworks Motorsport won the PC class in a gorgeous Martini livery, just ahead of 8Star. 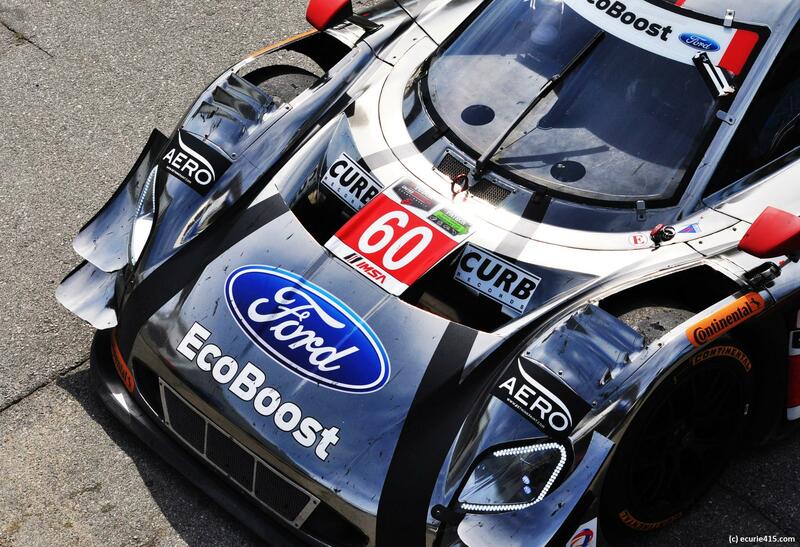 It wasn’t a great day for Ford, despite Ganassi’s third place. 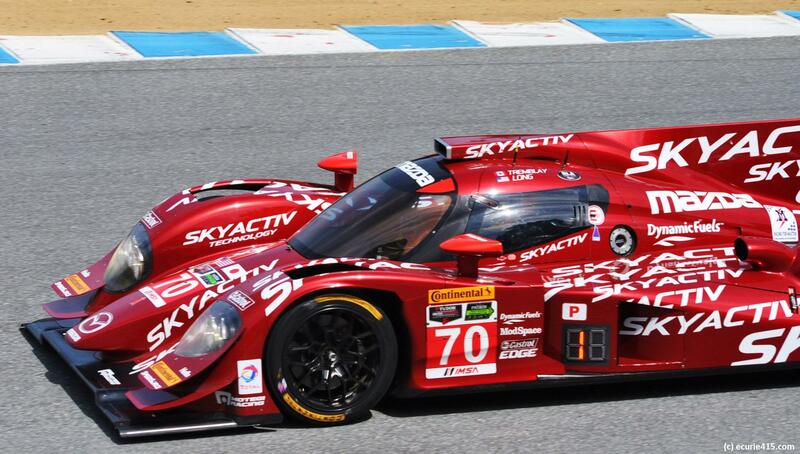 Mazda finished P7 with its Skyactiv Diesel LMP2. 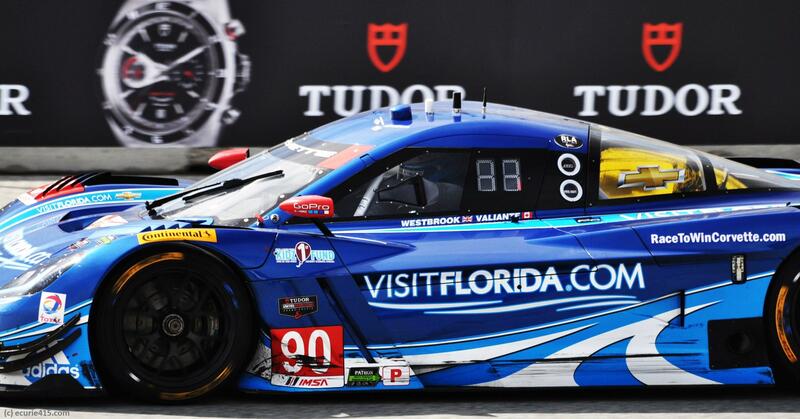 A modest result but huge progress for Speedsource, which has struggled with reliability. Mazda thinks that it has finally gotten a handle on the vibration issues that previously plagued the four-liter diesel. 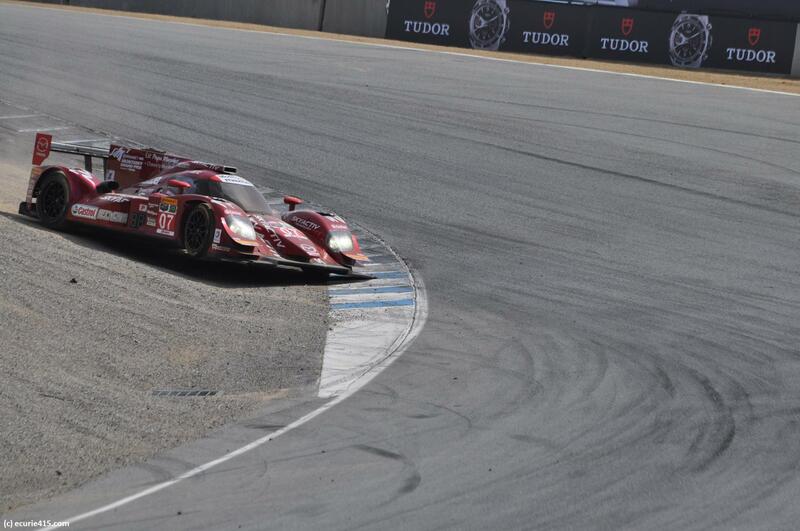 In its home race, Mazda would have brought both cars home but for the Brundle incident. 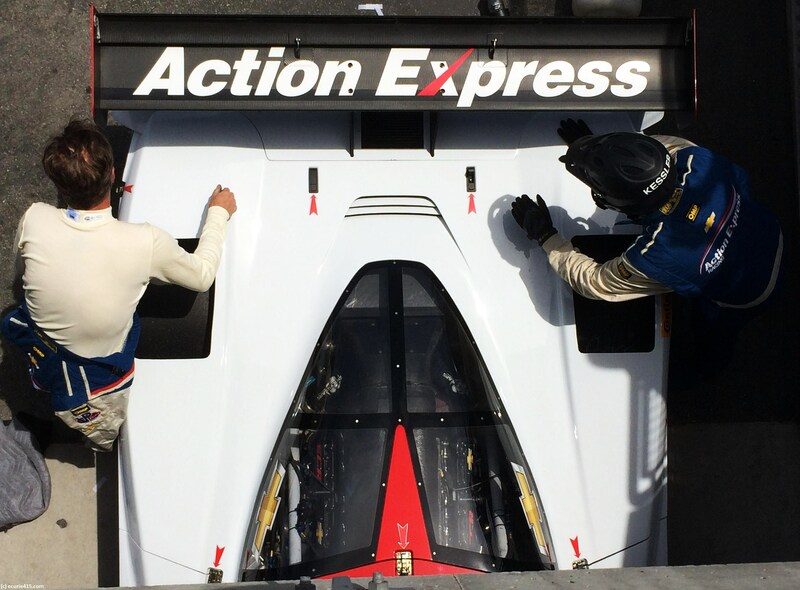 Buttoned up at Action Express Racing, for Christian Fittipaldi and Joao Barbosa. Despite a chaotic race, the team came away with fourth place and the points lead. Third place for Ganassi’s Pruett and Rojas. Johannes van Overbeek earned pole, and then turned the wheel over to owner/driver Ed Brown. Under intense pressure from the DP field, Brown managed to keep the car in contention long enough for “JvO” to return and score the win. 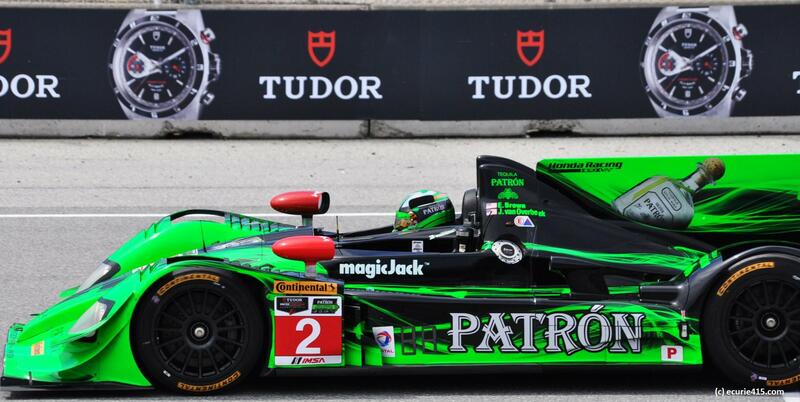 This entry was tagged ESM Racing, Johannes van Overbeek, Jordan Taylor, Mazda, Mazda Raceway Laguna Seca, Monterey Grand Prix, Patron, prototypes, Scott Pruett, sports car racing, Tudor United SportsCar Championship. Bookmark the permalink.